We dye the eggs red and then bash them together. The strongest egg wins good luck for the entire year. 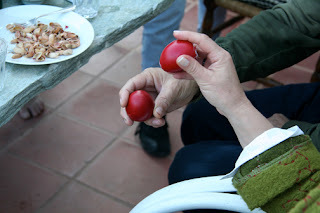 I chose my egg carefully, picking the most beautiful one - deep red with brownish flecks. Unfortunately, it was cracked even before I began bashing. Is there a life lesson in this? Possibly.